Cormous perennial with very distinctive, linear leaves with markedly crinkled edges, and pink flowers with a reddish ring around a central green marking. [RHSD]. ‘Found by Thunberg at the Cape, on the Roode Sand Hills, and near Picketberg. 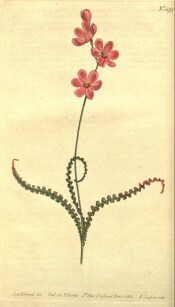 Introduced into Kew Gardens, 1787, by Mr. Masson. Flowers in June. Scentless. This rare and beautiful Ixia [Ixia crispa], so remarkable for its foliage, was obligingly communicated to us by R. Salisbury Esq.’ The flower figured has pink flowers. [BM t.599/1802]. 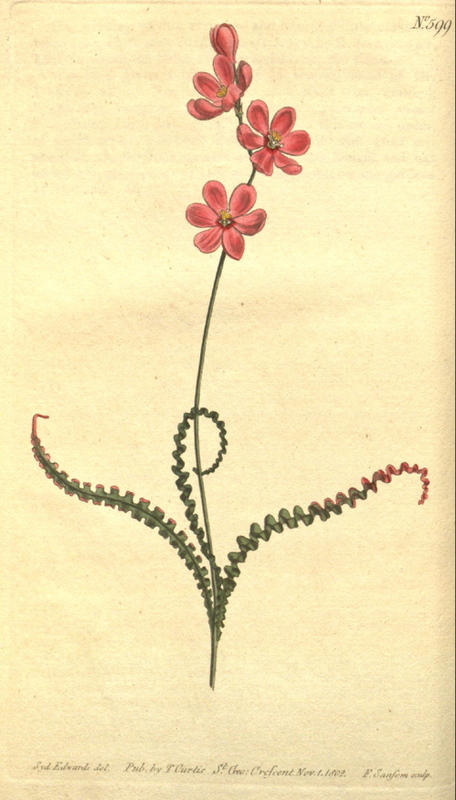 Paxton's Dictionary and Johnson's Dictionary describe the flowers as blue and they may be describing a different plant, although both give a date of introduction to Britain of 1787, which agrees with Curtis’s Botanical Magazine. Their plant may be the Ixia crispifolia var. flore caerulea figured in Andrews' Botanical Repository. This was introduced by Lady de Clifford in 1794 and distributed by Lee and Kennedy. [ABR pl.35/1798]. First recorded in an Addendum to the 1843 catalogue and in all subsequent catalogues [B.273/1843].